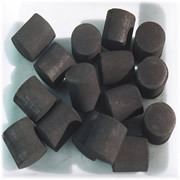 Cobalt oxide 3g per 10g sustained release pellet. A pressed sustained release pellet for oral administration. Indicated for the prevention and treatment of cobalt responsive conditions in sheep. Weight gain of lambs increased by 150% between birth and weaning compared to lambs on cobalt deficient pasture. 1 pellet every 3 years for all sheep over 8 weeks of age. Sheep may be dosed yearly on veterinary advice. Bulk or 100 pallets per pail. Re-assay to determine compliance to specifications 3 years after manufacture. View technical articles on cobalt deficiency.